Harry Potter and the Goblet of Fire (Harry Potter, #4) keeps having horrible dreams that wake him with the scar on his forehead throbbing. He is relieved to return to the magical realm from his summer break early to attend the Quidditch World Cup with the Weasleys, but the relief quickly gives way to a dark threat that looms over the magical world. Being a teenager is hard enough without having a Dark Lord seeking your destruction! Great story author and masterpiece. : This is the best book I have ever read. There are twists you would never see coming, there's plenty of drama, and way WAY more! Hard Cover. First Edition. Signed by J.K. Rowling on the dedication page. Bloomsbury. Hardcover. 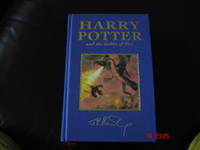 0747549710 Signed by J. K. Rowling on half-title page. First Bloomsbury Deluxe Edition. Purple clothbound with gilt lettering on spine and front; Full colour illustration to front board. Navy endpaper. All edges are gilt. . Fine. 2000. 1st Deluxe edition. Near fine first edition as stated on copyright page. Deluxe U.K. edition. Signed by J.K Rowling on title page. Previous owner's name on title page. Very light soil on gilt page edges. Housed in custom-made collector's fabric slipcase. London: Bloomsbury,, 2000. Octavo. Original pictorial boards, titles to spine and front cover in blue and black. With the dust jacket. An excellent copy in the dust jacket, tiny indentation on front panel. First edition, first impression, inscribed by the author on the title page: "To George, J. K. Rowling". It is uncommon to encounter this title inscribed: Rowling did a signing tour for the Goblet of Fire and the vast majority of autographed copies were just signed. London: Bloomsbury,, 2000. Octavo. Original pictorial boards, titles to spine and front cover in blue and black. With the dust jacket. A fine copy in the jacket with negligible creasing to spine ends, a couple of spots of glue residue to rear panel. First edition, first impression, signed by the author on the dedication page, and additionally signed by the cover artist, Giles Greenfield, to the front panel of the dust jacket. Copies of this work signed by both Rowling and Greenfield are notably uncommon. This copy is the rarer variant printed at Omnia Books, Glasgow. Bloomsbury, London, 2000 First Edition, First Printing with the words "First Edition" printed on the copyright page. This copy is authentically SIGNED by J.K Rowling. A magnificent copy. This First Issue dustjacket has the publisher's £14.99 printed price present on the front flap. This original dustjacket is vibrant in color with NO chips or tears. The book is bound in the ORIGINAL publisher's pictorial boards. The binding is tight with NO cocking or leaning and the pages are clean. There is NO marks or bookplates in the book. A fabulous copy SIGNED by the author in collector's condition. We buy SIGNED Harry Potter First Editions.. 1st Edition. Hardcover. Fine/Fine. London: Bloomsbury,, 2000. Octavo. Original pictorial boards, titles to spine and front cover in blue and black. With the dust jacket. A fine copy. First edition, first impression. Signed by the author on the dedication page, with the Golden Ticket from the signing session at Harrod's loosely inserted. London: Bloomsbury,, 2000. Octavo. Original pictorial boards, titles to spine and front cover in blue and black. With the dust jacket. Housed in a custom grey cloth slipcase. A near-fine copy in the dust jacket, with very light sunning to spine panel. First edition, first impression. Signed by the author on the dedication page, with the Golden Ticket from the signing session at Hatchards on 17 July 2000 (nine days after publication) loosely inserted. London: Bloomsbury,, 2000. Octavo. Original purple cloth, titles to spine and front board gilt, pictorial onlay on front board, black endpapers, all edges gilt, red silk page marker. No dust jacket issued. Faintly rubbed, a fine copy. First deluxe edition, first impression, signed by the author on title page. With the loosely inserted ticket (number 216) from the book reading and signing event held at Glasgow on 9 December 2000. London: Bloomsbury,, 2000. Octavo. Original pictorial boards, titles to spine and front cover in blue and black. With the dust jacket. A little shaken, very light spotting to edges, else a very good copy in the dust jacket, slight indentation to spine panel, front flap slightly creased. First edition, first impression, signed by the author on the dedication page, with the ticket for the signing session at Borders Books in Brighton on 18 July 2000 loosely inserted. Bloomsbury, 2000 First Edition, First printing, SIGNED by J.K Rowling on the dedication page. A stunning dustjacket that looks about new with no chips, tears or pieces missing. This original dustjacket is rich in color with no fading. The book is in excellent condition. The binding is tight, and the boards are crisp. The pages are clean with no writing, marks or bookplates in the book. Overall, a beautiful copy of this TRUE FIRST EDITION SIGNED by the author.. Signed by Author(s). 1st Edition. Hardcover. As New/As New. London: Bloombsbury, 2000. First British edition of Rowling's fourth book in the Harry Potter series. Octavo, original illustrated boards. Boldly signed by J.K. Rowling on the dedication page. Fine in a fine dust jacket. Cover illustration by Giles Greenfield. Cover design by Richard Horne. Harry Potter and the Goblet of Fire is the pivotal fourth novel in the seven-part tale of Harry Potters training as a wizard and his coming of age. "I'm relieved to report that Potter 4 is every bit as good as Potters 1 through 3 . . . The fantasy writer' job is to conduct the willing reader from mundanity to magic. This is a feat of which only a superior imagination in capable, and Rowling posses such equipment" (Stephen King, The New York Times Book Review). It is the basis for the 2005 film starring Daniel Radcliffe, Rupert Grint and Emma Watson. London: Bloomsbury, 2000. [Children's Literature] SIGNED FIRST EDITION. Octavo (21 x 14cm), pp.636. Signed by the author in the presence of Jon Gilbert, Rowling specialist, in July 2000, together with a bookmark from the independent book shop where the signing event took place (Dulwich Village Bookshop). Publisher's illustrated paper-covered boards, with the dust-jacket also signed by the cover artist, Giles Greenfield, priced at £14.99. A lovely fine, unread copy. London: Bloomsbury,, 2000. Octavo. Original pictorial boards, titles to spine and front cover in blue and black. With the dust jacket. Spine very lightly rolled, minor mark to top edge, else a near-fine copy in the dust jacket with tiny creasing at extremities. First edition, first impression. Signed by the author on the half-title. Bloomsbury, London, 2000 First Edition, with the words "First Edition" printed on the copyright page. This is the First Edition, First Printing of the deluxe edition. A spectacular copy. The book is bound in the publisher's original blue cloth and appears UNREAD. The binding is tight with NO cocking or leaning and the boards are crisp. The pages are clean with NO writing, marks or bookplates in the book. A superb copy.. 1st Edition. Hardcover. Fine. London: Bloomsbury Publishing Plc, 2000. Signed, first edition hardcover - very good. Flat signed on half-title page by author in front of seller at North Foreland Lodge School, Hants, in late 2000/early 2001, when Rowling made a special visit to the school as consolation after withdrawing permission for the pupils to enact the world's first stage production of Philosopher's Stone. Jacket is lightly edgeworn at points; spine ends bumped. Page block is a little tanned, with one or two small marks and imperfections. Pages are clean and binding is sound. More photographs available upon request.. Signed by Author. First Edition. hardcover. Very Good/Very Good. Used. First edition first print hardcover with dust wrapper, inscribed without provenance . The book is in very good + condition. United Kingdom: Bloomsbury Pub Ltd, 2000. 1st Edition . Hardcover. Near Fine/Near Fine. 8vo - over 7¾ - 9¾" tall. FIRST AUSTRALIAN EDITION. SIGNED BY THE AUTHOR. BOOK DESCRIPTION: 8vo, HARDBOUND WITH ORIGINAL PICTORAL BOARDS AND DUST-JACKET. BOOK & DUST-JACKET CONDITION: NEAR FINE; SLIGHTLY BUMPED, OTHERWISE A FINE COPY. During his third year at Hogwarts School for Witchcraft and Wizardry, Harry Potter must confront the devious and dangerous wizard responsible for his parents' deaths. Collectible/Fine/Not issued. Brand new factory shrinkwrapped stated first edition/first printing. Cello may be slit to confirm first edition status else flawless & unread. Quickly becoming scarce! Please contact me by clicking on my seller name with Q's about this or any of the deluxe first editions. Private seller, providing fast delivery w/ immediate email notification & excellent service. New York: Scholastic, 2000. signed by J. K. Rowling on the title page. This is the twelfth printing. . Signed By J. K. Rowling. 12th Printing. Hard Cover. Fine/Fine. Illus. by Mary Grandpre. 6 1/4 x 9 1/4 ". New York: Scholastic Press. Near Fine/Near Fine. 2000. Hardcover. 8vo - over 7¾" - 9¾" tall 0439139597 Signed by Author NW/LO-Near fine regular size hardcover; small, faint spot on the page edges in a near fine jacket that has a small area of "puckering" of the jacket's plastic overlay on the lower cover. Rowling has SIGNED the title page. Later printing. .
London: Bloomsbury, 2000. First Edition in the deluxe publisher’s binding. Illustrated throughout. Thick 8vo, publisher’s original purple cloth lettered and decorated in gilt and with a pictorial onlay in colours on the upper cover and spine. 636 pp. A mint copy, unused and as issued, in impeccable condition. FIRST EDITION OF THE FOURTH HARRY POTTER BOOK. Scholastic Press, 2000. First Edition. Hardcover. Good. Disclaimer:A copy that has been read, but remains in clean condition. All pages are intact, and the cover is intact. The spine may show signs of wear. Pages can include limited notes and highlighting, and the copy can include previous owner inscriptions. The dust jacket is missing. At ThriftBooks, our motto is: Read More, Spend Less.Dust jacket missing. First edition, first printing. SIGNED by the illustrator. Shelf and handling wear to cover and binding, with general signs of previous use. Signed on the date of release, July 8, 2000, Wow! Interior otherwise clean and unmarked. Secure packaging for safe delivery. Bloomsbury, 2000. First Deluxe Bloomsbury Edition. Cloth. Fine/No Jacket as Issued. A handsome First Edition (so stated) of the Deluxe Bloomsbury Edition in purple cloth with gold titling, gold gilt page edges and bound-in shiny red bookmark. Published in the U.K. and prohibited from original sale in the U.S. In fine condition. The edges have the customary light rubs but very minor. A nice copy. London: Bloomsbury, 2000 First printing of the British (and true) First Edition of the fourth Harry Potter book. This is the first printing by Clays, with the errors on pages 503, 579, & 594. Book and dust jacket in fine, as new condition. Fine/Not issued. Brand new factory shrinkwrapped stated first edition/first printing. Cello may be slit to confirm first edition status else flawless & unread. Quickly becoming scarce! Please contact me by clicking on my seller name with Q's about this or any of the deluxe first editions. Private seller, providing fast delivery w/ immediate email notification & excellent service. Arthur A. Levine / Scholastic Press. 1/2 BLACK CLOTH WITH R .... Rowling, J. K.. Harry Potter and the Goblet of Fire. Signed by the illustrator. Illustrated by Mary GrandPre. New York City: Arthur A. Levine / Scholastic Press, 2000. 1st American edition, 1st printing. 734pp. 8vo. Book condition: Very good with bumping to bottom corners. Dust Jacket Condition: Fine. Signed by the illustrator, Mary GrandPre, on the title page. . Very Good. 2000. London: Bloomsbury Publishing. 2000. First Edition; First Printing. Hardcover. 074754624X . Near Fine in a Fine dust jacket. First Edition stated. The First Issue dust jacket has the publisher's £14.99 printed price present on the front flap. ; 7.80 X 5.28 X 2.20 inches; 636 pages; Original unclipped dust jacket protected by archival Brodart cover. All domestic orders shipped protected in a Box. .
Scholastic Press, 2000. First Edition. Hardcover Hardcover. Near Fine/fine. A highly collectible true 1st Edition/ 1st Printing! The number line does count down to 1. The dust jacket is in pristine, as new condition, except for a crease inside the front flap, but it is a straight, even crease. An excellent copy for a collector! Watch out for those trying to pass off later printings, this is a true 1st! Ships same day bubble-wrapped AND BOXED w/ standard shipping. Free tracking. 100% Guaranteed. Dust jacket is now protected in a clear, removable, archival cover. Book is currently being protected in (and ships in) a clear archival sleeve. ISBN: 0439139597. ISBN/EAN: 9780439139595. (New York): Arthur A. Levine, 2000. 8/17/2009. Fine/Fine. First American edition. Fine in fine dustwrapper. A lovely copy of the first printing of the first American edition with all points. 2003-06-08. New. Ships with Tracking Number! INTERNATIONAL WORLDWIDE Shipping available. Buy with confidence, excellent customer service! New York: Scholastic, 2000 Some edge and shelfwear. Signed and inscribed by Grandpre on the title page and dated 2001. Thirteenth American printing.. Signed. Hardcover. Very Good/Very Good. Illus. by Grandpre, Mary. Youth. 2000-06-01. New. Ships with Tracking Number! INTERNATIONAL WORLDWIDE Shipping available. Buy with confidence, excellent customer service! 2001-02-05. New. Ships with Tracking Number! INTERNATIONAL WORLDWIDE Shipping available. Buy with confidence, excellent customer service! 2000-01-01. New. Ships with Tracking Number! INTERNATIONAL WORLDWIDE Shipping available. Buy with confidence, excellent customer service! Bloomsbury, 2000 Deluxe First Edition. Published in London by Bloomsbury in 2000. "First Edition" stated on copyright page. Book fine. No DJ, as issued.. First Edition. Hardcover. Fine/No Jacket. Bloomsbury, 2000. First edition-first printing. Hardcover. Very good/Very good. VGC.Bloomsbury Publishing,2000.First edition-first printing.Pictorial hardback(small nick on the edges of the cover and spine) with Dj(a couple of small creases and nicks on the edges of the Dj cover),both in VGC.Nice and clean pages with ink mark and slightly tainted on the outer edges,previous owner's name and small inscription written inside the edges of the front cover, couple of small creases and light shelf wear on the edges of the pages.636pp.Price un-clipped.Printed in UK by Clays.A collectable first edition-first printing contains the errors that were made during first printing and were later corrected. Book Description: The summer holidays are dragging on and Harry Potter can't wait for the start of the school year. It is his fourth year at Hogwarts School of Witchcraft and Wizardry and there are spells to be learnt and (unluckily) Potions and Divination lessons to be attended. But Harry can't know that the atmosphere is darkening around him, and his worst enemy is preparing a fate that it seems will be inescapable ...With characteristic wit, fast-paced humour and marvellous emotional depth, J.K. Rowling has proved herself yet again to be a master story-teller. 2000-05-03. New. Ships with Tracking Number! INTERNATIONAL WORLDWIDE Shipping available. Buy with confidence, excellent customer service! Turtleback Books. SCHOOL & LIBRARY BINDING. 0613496744 New Condition. . New. New York: Scholastic Press, (2000), 2000. First Edition, First Printing . Hardcover. Fine Condition./Fine Condition.. 8vo. pp. xi, (3), 734, (3). Dust jacket protected in a mylar sleeve. Stated first American edition with the number '1' in the number sequence. Not price clipped. In beautiful, gift quality condition. London: Bloomsbury, 2001 Book. Very Good +. Soft cover. 1st Edition Thus. A very nice copy, crisp and square. NO spine creases indicating that is copy has possibly not been read. Gift inscription on first page (half-title) -"To Sam From Alessandra and Massimo, Paris November 2001" and some very minor exterior indentations where original price stickers evidently were - lower spine and top right of front. Number line on copyright page is "10 9 8 7 6 5 4 3 2 1.". Pen and Sword Military. First UK edition-first impression. Hardcover. Fine/Near fine. Near fine condition.Pen and Sword Maritime,2008.First UK edition-first impression.Black hardback(gilt lettering to the spine,the front cover of the book is slightly bent) with Dj(two small creases and nick on the edges of the Dj cover),both in near fine condition.Illustrated with b/w photos,drawings.Nice and clean book as new except for the slight bent of the front cover.316pp including Foreword,appendices,bibliography,sources,index.Price un-clipped.A collectable first edition.Heavy book. This is another paragraph Book Description: The Royal Navy battleship HMS Rodney was one of the most famous warships of the Second World War. Rodney and sister ship Nelson were, at the beginning of the conflict, the most modern battleships Britain possessed. As such, Winston Churchill referred to them as the country's Captains of the Gate. This book tells Rodney's story, from her inception in the 1920s, through the notorious Invergordon Mutiny to her key roles in many crucial naval engagements. In May 1941 Rodney turned Bismarck, the pride of Hitler's navy, into twisted metal. She also participated in hard-fought Malta convoys, and supported the D-Day landings. Through the eyewitness accounts of her sailors and marines the reader discovers what it was like to serve in a battleship at war. We also learn of the many famous fighting admirals who served in, or commanded, Rodney, including Admiral Sir Andrew Cunningham and Admiral Sir John Tovey. Cunningham's harsh management style is highlighted as a possible cause of mutinous conduct by her sailors, which led to Rodney being unjustly branded `The Red Ship'. The stories of previous British warships to carry the name Rodney, dating back to the 1750s, are also covered, including the vessel that took on the batteries at Sevastopol during the Crimean War. The Barnard-built 74-gun ship of the line that supported Wellington's troops in the Peninsular War is also featured, possibly the most detailed account yet of her life. As well as presenting a fresh perspective on Bismarck's destruction, the author provides new insights into a bomb hit on Rodney off Norway in 1940, which nearly made her the first British battleship lost to air attack. The book also contains an account of how a group of the battleship's sailors took part in the first ever British commando raid. Rodney's vital role, through her formidable naval gunfire support, in breaking the morale of Waffen SS divisions during the battle for Normandy, is covered, including the remarkable part played by code-breakers in directing the ship's guns. It all makes for an exciting, epic account of naval warfare. 2002-08-09. New. Ships with Tracking Number! INTERNATIONAL WORLDWIDE Shipping available. Buy with confidence, excellent customer service! 2000-04-03. New. Ships with Tracking Number! INTERNATIONAL WORLDWIDE Shipping available. Buy with confidence, excellent customer service! 2002-01-01. New. Ships with Tracking Number! INTERNATIONAL WORLDWIDE Shipping available. Buy with confidence, excellent customer service! 2000-01-03. New. Ships with Tracking Number! INTERNATIONAL WORLDWIDE Shipping available. Buy with confidence, excellent customer service!